He Makes All Things New: Stuck in Plan B? Do you ever feel as though your life is stalled, stuck in “Plan B”? And you’re swimming upstream desperately trying to revert to “Plan A”? I, too, have felt this way and continue to feel this way at times. Raising my twins together was Plan A. 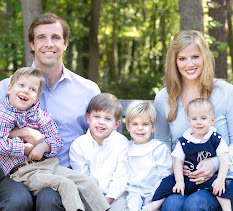 Having healthy, talented, godly, charming children was Plan A. Bumping along with normal, acceptable bumps was Plan A. Being thrown off course entirely, not so much! Having to say goodbye to a son on earth just as we welcomed him into our arms certainly felt like Plan B. Struggling alongside another son… you guessed it: Plan B. Miscarriage when we desire to grow our family and build a team around John and give additional siblings to Daniel? Also Plan B. Trying to fit John for a new head support and chest support strap for his adaptive stroller. I realize that any of us can look around and quickly find someone who either has it “better” or “worse.” But I want you to consider the ways in which your life feels like it took a detour, leaving you glancing back over your shoulder at the coveted Plan A you had mapped out? Fortunately, we are not alone. The Bible is full of people who share our plight… many due to their own wayward schemes and others by no fault of their own. Again, I can relate to both scenarios! Take Mary and Joseph. We all know their story so well that it is easily taken for granted how their lives were certainly thrown into Plan B. Yes, we know the Virgin Birth is wild. We know Joseph was not expecting his fiancé to become pregnant before marriage and certainly not from a source other than him. But I am drawn to the nuances found later in their story, once baby Jesus enters the scene and his parents have to scurry from one place to the next to avoid the wrath of the reigning King Herod who sought to kill all baby boys age 2 and under. Even when we receive messages from God’s very angels or feel led to an initial route, life can throw us curve balls. But there is good news. We serve a God who is in control. A God who has it all planned out in His sovereignty and in ways that we may not be able to comprehend this side of heaven. With our God, there are no Plan B’s. Jesus wound up in Nazareth, not because of a last minute change as it must have appeared to Joseph in his dream, but to fulfill prophecies dating back hundreds of years before Christ’s birth: that Christ would live in Nazareth and be called a Nazarene. Wow! Like I said, this may seem to be a small nuance, but this detail truly spoke to me, both humbling me and building up my faith in the One who only has Plan A in store for us. It may appear and feel otherwise, but I pray today that you and I both will trust the Lord with what appears to be our Plan Bs… trusting we are in “Nazareth,” just where we are intended to be. Nothing is impossible with God, not even what we deem Plan B. So proud of you ME: an inspiration to all! Love these pictures of your precious Plan A. We are just along for the ride, huh?